Supergroups are releasing albums every week nowadays and here we have another brainchild band from Mike Portnoy. 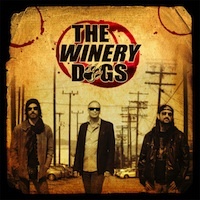 The Winery Dogs is the name of this new project with three giants in the hard rock business; Mike Portnoy (Dream Theater, Adrenaline Mob), Richie Kotzen (Poison, Mr. Big) and the bass genius Billy Sheehan (Mr. Big, Steve Vai, David Lee Roth). I must praise and raise this album to the sky. I can listen to this album a hundred times and still find delicatessen and twists with every new spin. Smacked with groovy rock n roll and adorable, professional musical finesse. I have not been a fan of Kotzen's vocals earlier, but in this high octane trio he is singing and playing guitar like never before. Portnoy's drumming is as always magnificent and astonishing, variable and technical and Sheehan's bass playing is absolutely stunning. I have a new favorite songs everyday and this is (anyway in my world) one of the best albums this year. If you want to learn how to to play or write high quality hard rock music, just sit and listen to this and you will have an ocean of knowledge to scoop from. Funky and technical rock with influences of the progressive rock/metal makes sure that this album will surely qualify for my 'best album of the year' list. I hope that this isn't an one album project because I want to have more of this, much more! !